Lost Cat: two of the saddest words cat lovers dread, but one of the happiest book reading experiences of late. When the publicist sent copy of Lost Cat: A True Story of Love, Desperation, and GPS Technology by Caroline Paul and illustrated by Wendy MacNaughton arrived, I planned to read a few pages in the garden with a glass of wine before dinner. A few pages turned into dinner being late. I had to find out what happened to Tibia (Tibby) Caroline Paul’s cat who slipped through his cat door in San Francisco and vanished for five weeks. He returned plump and smug and Caroline became obsessed about finding out where he’d gone. 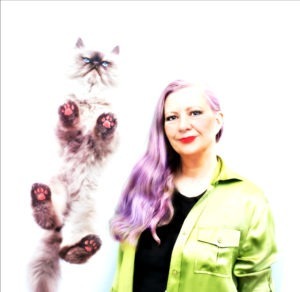 Pet psychics, kitty cams and mysterious neighbors oh my! This is what’s called a page turner for good reason. The sparkling prose by fiction and nonfiction writer Caroline Paul and the funny, pitch perfect illustrations by Wendy MacNaughton captivate and capture what it means to love both 2 legged and four-leggeds. Before Tibby disappeared Wendy, Caroline’s live-in partner Wendy wasn’t initially a cat person but after Tibby vanished she transformed into one. That is the power of purr. I’m delighted to share our Q & A with Caroline and Wendy. 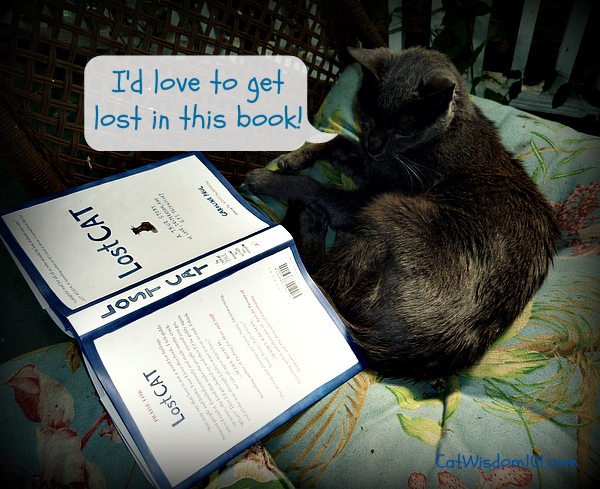 One lucky reader will win their own copy of Lost Cat. LMW: With this book and the BBC documentary tracking 50 U.K. cats, do you think we’re going to see more GPS tracking or high tech devices used on cats? CP & WM: In 2009, when we first started to track Tibia, there was only one rudimentary device available for cats. Now there are so many! What was once just curiosity can now become an obsession. Everyone wants to know what their animals do when they’re on their own, out of your sight. Most of us think we understand our cats. But there’s another part of us that realizes that our cats are independent creatures with a wild side to which we aren’t privy. It’s that part that buys a GPS! This urge to figure out the mysteries of our cats is not new. But now technology has caught up. But to those who want to track their animals: be aware that GPS doesn’t answer everything. When I was tracking Tibia I told myself I was trying to figure out where he was wandering. But what I really wanted to know was why he was wandering. The GPS figured out the former (I also used cat cameras, pet psychics, pet detectives, and an animal communications class with varying degrees of success.) But the tracks showed a cat with a life that was much more complicated than I supposed. That was a shock. In some ways, GPS opened up more questions than it answered. LMW: Do you have any practical advice for anyone who has lost a cat or anything you would have done differently? All cats should be micro-chipped and the information constantly updated. In our case it wouldn’t have helped (read the book to find out why), but we have since heard stories of cats gone for three years, seven years, even 13 years, who were reunited with their owners because the address on the microchip was current. CP & WM:The rest of my advice is simple: don’t give up hope. And keep searching. We have a website of lost cat stories (http://lostcatbook.com) that show how the persistence of owners and the tenacity of cats results in happy reunions. Often cats adopt another family, or more than one. I heard a great story about missing cat posters going up around a neighborhood, all from different families who thought they owned this one specific cat. Turns out a separate family, who also thought they were her owners, had gone on vacation and boarded her, which was why she failed to return to her many homes. There are also good books out there about how to find a lost cat. In particular I like How to Find Your Lost Cat, Advice from a Pet Detective by Kimberley Freeman. LMW: Cats have never been hotter culturally. Why do think that is and where might the trend be heading? CP & WM: Cats are cute, let’s face it. And cute is perfect for the internet videos in which they so often star. They also have this aura of mystery, because they’re so inscrutable. We laugh especially hard at their antics because they’re constantly surprising us.I’m the wrong person to ask about internet trends, but I do hope it involves cat cameras and GPS. LMW: Wendy, this experience transformed you into a cat person. How else did it change you? WM: Animals open up your heart. That love spreads out into the world. I’m much more of a softie toward any creature, human or kitty. I’m just a better person overall for learning how to love a cat. LMW: Caroline, what did Tibby and Fibby teach you about yourself? CP: At the time I began to track Tibby, I’d had my cats for 13 years. They were the longest relationship of my adult life. I thought I knew them very well – Fibby was the sociable one, and her brother Tibby was shy and skittish. But when Tibby disappeared for over five weeks and then returned, fat and happy, I had to come to grips with the fact I didn’t know Tibby much at all. Who was this swashbuckling adventurer? In fact I probably didn’t know either of my cats as well as I had thought. Like our human relationships, we can’t know everything about our beloved. In the end I had to accept that love was enough. LMW: When and how did Tibby die? What or who is new in your kitty family? CP: Tibby died at the age of 18, just before the book came out, of renal failure. By then we had already adopted two more kittens from the pound. They looked up to him, and I think he liked that. LMW: Are you still using a cat door? CP & WM: We understand that there’s a big controversy about whether to let cats outdoors. We try not to get involved, but yes, we let our kitties out. But we bring them in at night. We understand the risks, and that they may wander like Tibby did. Plus we are once again under the foolish human delusion that we know our cats well and they love only us, and they’d never want to leave home for any reason at all. Gris Gris gives Lost Cat our top rating of 4 PAWS. Only five days left to nominate us for a Pettie Award. Purrrrs of thanks for your continued support! 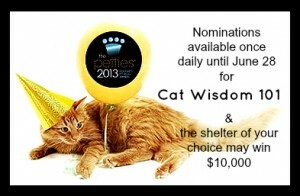 CLICK HERE TO NOMINATE CAT WISDOM 101 PLUS YOU CAN WIN $10,000 FOR YOUR FAVORITE SHELTER OR RESCUE GROUP. After 25 years or so of dedicated services, my Sunbeam Mixmaster handed out. quickly found out that they just don’t make things like they used to! So That I got a new kitchenaid, like everyone else. It’s been some years ago now and I also still don’t like that Kitchen Aid! of the bowl obtain incorporated into the batter, and it really is just too big and heavy! I would love to win a copy of this book. First off let me preface this by saying I am a very emotionally grounded and stoic guy. Just my make, and how I was raised. About 12 years ago, after I came home from work, my wife came into my office and told me my cat, Casey Jones got out and got run over by the neighbor’s car. (Run over, not killed. THe tires never touched him and he was under the car when they backed out.) and he took off running. I ran out looking for him, I was running through the woods, all over the place trying to find my boy. I honestly don’t remember much but my wife told me I was oblivious to anything around me, and I was getting sick, and vomiting due to the stress. I could not find him, and ended up back at home, my slacks and dress shirt shredded and blood stained from the briars I was running through. I was a mess ballin’ my eyes out. About an hour later, Casey came home and I quickly took him to the vet for a check up. ( a few cuts and scratches, and a missing toenail, but he was fine.) That was the worst day for me until 10 years later when I had to put Casey Jones down due to health complications at the age of 17. Rest in Peace Kitten. Shortly after we met her Jaguar ran away for about 2 hours . Only she knows what happened but she has not tried to escape since. I would love to read this book. I am fortunate never to have lost a cat but deal with “lost” cats regularly in my rescue work. Forgetting that one of my sliding door screens had a hole in it, I opened the door. Then as I was about to leave, I realized my cat wasn’t around. I walked to the sliding door and then realized what I had done and knew that Chelsea walked out. I was freaking out and saw my life go by. I eventually found her near the bushes of my patio and had to lure her in with food then lead the way for her to get in while holding her. She had a taste of freedom for a bit and liked it haha. She hissed inside then calmed down. I made sure I was careful for now on. This sounds like a fun book to read, thanks for this contest. I’d love to read this story. I must agree with several others who advocate for indoor only. I volunteer for a no kill shelter where our policy for adoption is indoor only. Exceptions are secure outdoor enclosures and training your cat to a leash and harness. There are too many hazards. Ask yourself if you know if all of the neighbor cats are vaccinated, have tested negative for feline leukemia and FIV, and are free of fleas and worms? What if your cat gets into a fight? Are you ready to pay the vet bills for an exam and antibiotics? Why is it suppose to be ok to let cats roam free and not dogs? I think it’s time for leash laws for cats. Also, are you confident that your neighbors wouldn’t harm your cat if it strayed into their yards and used their garden as a litter box? Are you sure you don’t have neighbors who would leave out poisonous substances that your cat could eat or lick from their fur? Many cats get hit by cars or attackef by other animals. Even if they did survive, could you afford the thousands in vet bills? I can’t blame the cats. It’s time for cat owners to take responsibility for keeping their cats safe. We thought we lost a cat, we had company and Yoshi was no where to be found. With children and adults running in and out all day we figured he escaped outside. I was so scared for him because we live off of a two lane highway. It turns out that he was hiding probably because he was not used to all the noise and people. It was a sleepless night until he started screaming for his breakfast the next morning. I would love to read this book. I hope I never have to face having a lost pet. Also, when I lived with my parents on our family acreage most of our cats were barn cats although they were as spoiled as house cats. We lost so many of them. The most recent loss was Mewdy Blue. I still don’t know how he got out because none of my cats is allowed outside now except on a leash. He was gone for about 24 hours, just enough time for me to scour the neighborhood, hand out posters to every house in a 2 block area, hang posters in all our town businesses, call the police and the vet who takes in strays. When I got home there he was sitting in the neighbor’s driveway yowling and fearful. He is microchipped but that didn’t make me feel any better. I’m so glad he’s home. That sounds like a great book and we’d love to win it. Our mom has never lost a kitty, but she has adopted ones out looking for homes. She believes her third kitty was living at his first home and scouting out a second when he found her. After hanging around a couple hours a day for a few weeks, he made his move and took up residence on her porch until she relented and brought him in. He went in and out all day long, but he came home at night and he never left for his first home, or a third. That sounds like a wonderful book. Mom Paula is fortunate she’s never lost a kitty (or woofie). That sounds like a lovely book. Thankfully I have never lost a cat. They probably never wanted to wander off with all the mice close by in the fields. I have a lost kitty now..She is an indoor cat but she ran past my boyfriend as he came in the door..This will be the 5th week she is gone..she hung around here for a while but would not come to us..I don’t know why because she is so much loved..We also put food out for her so she wouldn’t be hungry..My heart is breaking and I have been crying a lot..We miss her so much..Her name is Molly and she is so beautiful..
Nancy, I’m so sorry to hear about you lost cat. Any word? Did you follow some of the suggestion in the article link? What a fascinating interview! Hope I win the book, but I’ll definitely be getting a copy to read if I don’t win. I have three cats. The two younger cats are not allowed outdoors. But my boy Tommie (15 years old) was born feral at a time when it was common to let cats out. He’s my gardening buddy; mostly stays in our yard these days and comes when he’s called. He is always in for the day before dark. About 5 years ago he disappeared for 3 days. We were devastated and put up signs, searched and searched. It turned out that he got shut in a neighbor’s greenhouse and came back thinner and almost as happy to see us as we were to see him. Oh yes, Ping got lost. We use to allow him to go outside during the day. He always came home. Except for the night he didn’t. Of course he chose the coldest night of the year. He didn’t come home the next day again it was super cold (for FL below freezing) and that went on for several days. WE nearly gave up and then he casually strolled up to the door one afternoon. THAT was the last time he was ever allowed outside. He came home with an UTI and we are just thankful he came home. I didn’t know that about Ping! Thanks for sharing. A simply amazing story, truly amazing with a happy ending. Amazing, too, where cats go. It would be wonderful to get it all down, for outside cats. For our boyz, we know where they are. If we don’t see them, they’re in the finished attic on top of a box, in the hottest, sunniest place, sleeping. We would love to win that wonderful book too. We’ve never lost a cat but we have tried to help many who have lost their baby. This sounds like a five paws up kind of book! Having a kitty MIA is so terrifying! When my little feral Shadow didn’t show up for three days I was soooooooooooo scared that something terrible had happened to him. I think that it is a great thing that we don’t know everything about our cats because that is part of their allure…. This sounds like a great book. None of us have ever gotten lost, but one of the cats before us got out and was missing for a few hours. The mom and dad hunted all over the neighborhood for him…and it was night time so it was hard to see…but they finally found him a few hours later hiding in some bushes. The mom was so relieved! This sounds like a FABULOUS book and what a CATABULOUS review!! Sounds like a lovely book……I’ve never lost a cat before but I did have one “disappear” for four days – the longest four days of my life I might add! Charli was an in/out cat who would ALWAYS return to the house at the sound of a jingling bell….then one night she didn’t. I scoured the neighborhood, posted signs, cried my eyes out…..and one night while I was watching TV after beginning to reconcile myself to her loss, she came back home through the cat door – limping but happy to be home from whatever adventure she’d had. She was the LAST “outdoor” cat I had though as I never wanted to go through that again! My human was pretty sure that the cat before me had at least one other home where she cadged meals, but that was long before GPS existed. This sounds like a great book, although as the author pointed out, it won’t solve ALL mysteries we kitties have. I would love to win this book. My tabby cat, Queenie, escaped out of my front door one time when I was bringing groceries in. She escaped to the lobby of my apartment building and hid behind a potted tree. She was so scared I was able to reach down and pick her up. This is the worst scare she has ever given me. She is microchipped and wears a collar with identification but I was so scared she would run out the main door and get to the parking lot or street and get hit. Whenever I bring groceries in now she and Princess are confined to the bedroom. I was lucky that time and didn’t lose her.